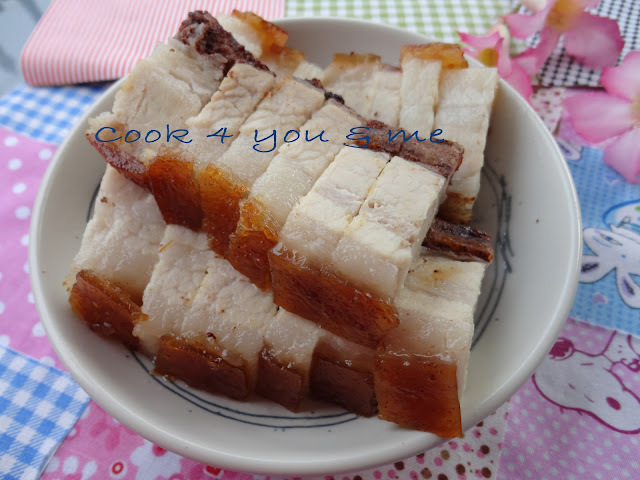 This also my sister request.She request many time but i lazy to make.She say,she very miss the salty taste of the homemade roast pork belly.We long long time didn't make this roast pork belly.My mother say she not very remember the recipe.So i search for the recipe.I choose Christine's Recipe.It not much seasoning. 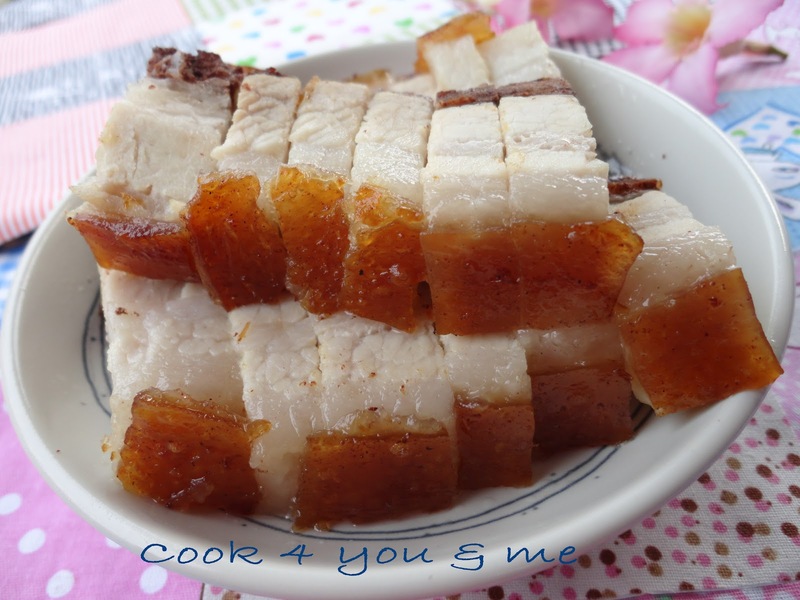 It look very nice but the skin not enough crispy.Taste enough salty and the meat is so tender.It melt in my mouth.Do not have to chew very long.They'll love it.Especially my boyfriend.He say like bought at store. Combine salt with sugar and five-spice powder and set aside. Rinse the pork belly. Blanch in boiling water for about 15 minutes and the skin is softened. Drain well and wipe dry. Use a fork to poke the rind as many holes as possible. Turn over the meat side, cut a few slits on it.It help absorb seasonings better. Rub the cooking wine over the pork.Rest for awhile. Cover the meat with seasoning.Make sure there no seasoning on the skin.If not the five-spice will darken the skin. Wrap the meat with foil.Don't cover the skin.Let the skin dry up in fridge.Marinate overnight. Remove from fridge and let it rest at room temperature for a while.Poke the skin with fork once again.Wipe dry.Season the skin with salt. 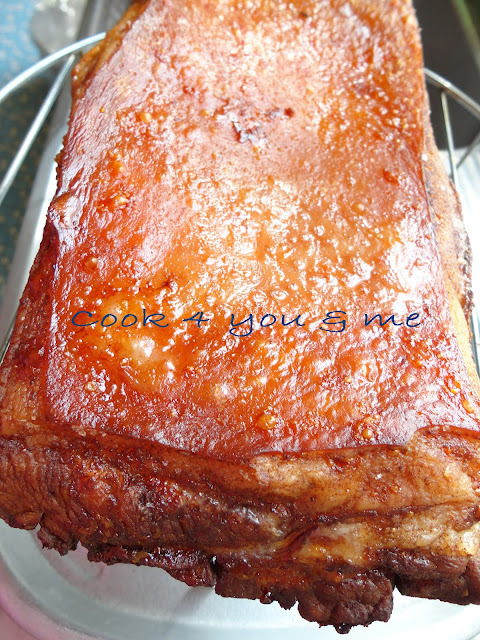 Bake the pork belly in preheated oven at 220'c for 1 hour 45 minutes. Remove and let it cool down before chopping. looks very gooood even though you said the skin not crispy enough. 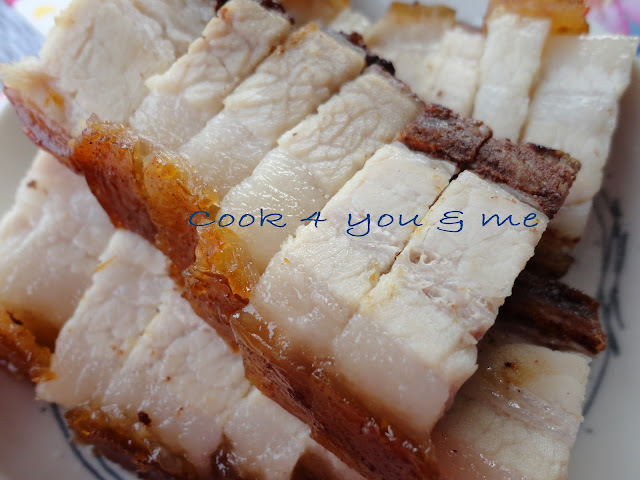 I've not attempted to make siu yok yet!